‘Cuts and grazes: A creative view of the spending review’ will open its doors to the public on Monday January 10. On display will be work from ten emerging artists addressing the impact of government cutbacks to the arts. 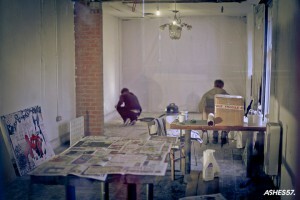 Tucked away in the student hub of Fallowfield, a derelict old room has been transformed into a platform for artists to showcase their work. Against the background of spending cuts some may think it unlikely a volunteer led, self-funded art space could sustain itself past the honeymoon period of hyperbolic openings. The Art Corner however refute this, and will continue to display and host exhibitions into 2011 after a three month trial period last year resulted in a permanent residency. ‘Cuts and Grazes’ features a range of work over two rooms. This includes a poem from MMU student David Picken entitled ‘Polemic Lib Dem Polls’, which speaks of a dissatisfied nation and offers a possibly prophetic warning to Cameron and Clegg. The result of a collaborative effort from Joshua Miller and Nicky Watson is a sculpture exploring the negative implications of the cuts for aspiring young artists looking forward towards university. Meanwhile Jane Lawson, a student at the University of Salford, presents her endeavours through a 1980’s Revival Mind Map. Jane lived through the 1980’s and her art explores some recurring themes in society. In particular she looks at our current predicament, namely a right wing government projecting faux-caring Big Society rhetoric, brutal cuts to the public sector and another royal wedding – which leads the artist to experience a sense of déjà vu. The exhibition presents pieces in a variety of styles and form. Nevertheless all of the works on display lean heavily on the central theme of raising public awareness of the collective experience of the cuts, which reflects the ethos behind the collective’s selection process. 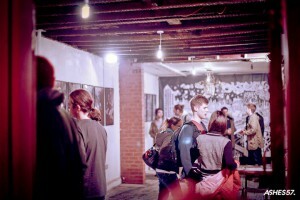 Future plans are to carry on supporting the local and national community of emerging artists. More pop-up galleries will not be forthcoming. The collective affirm they are in a great space and they intend to keep using it. 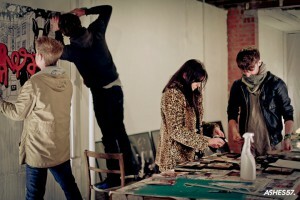 Funding comes from the collective’s pockets, donations, and the 30 per cent commission they take from the sale of any work exhibited with any surplus money ploughed back into the project. By renovating a disused building, the collective have created an art space in what was formerly abandoned. Using a do-it-yourself philosophy to promote, support and showcase emerging artists in the North-West and beyond, the Art Corner is a welcome addition to South Manchester. Well, unlikely or not it’s welcome. Volunteer led, self funded arts people are better for the local taxpayer than council funded arts people. Council tax payer want their cash spent on useful things, not middle class ‘artists’ keen to get their snouts in the public sector money trough. What an ignorant thing to say. In such a sorry state of society, which I’m sure you’re all for Simon, such enthusiastic and worthwhile projects should be commended not slated. You could learn from something like this, maybe try it. On a more positive note, The Art Corner is well worth a visit, I would definitely recommend it.